Honey Pot Radio. Our weekly webcast radio show, totally insane stuff, lots of archived audio and pics. Live every Thursday around 7:30 pm San Francisco time from the Wrybread Events Arena. The Saga of Van Glorious. Van Glorious stuck in the dreaded Donner Triangle. New Moonie. A photo narrative of a trip to the Black Rock desert in the Burning Man off-season. We set up a video booth at webzine99, where we encouraged people to act as goofy as possible. Here's the videos. Cyberbuss Costume Ball. Some audio and video and writings from the annual SF event. The WryBreadBox. Winter camping in Van Glorious the Wrybread van. A weekend's roadtrip to Mt. Shasta aboard the always user-friendly Cyberbuss. Sort of the sequel to Notes from the Road, emails from the road here and there across the American Outback. Guano on the Road. Lieutenant Gespacho, aka Guano Biscuit's dispatches from Europe and South America. Hiss Line. One of the first Wrybread internet projects, I put stickers on countless New York City payphones asking people to call my voicemail (352-HISS) and "say something interesting". Unfortunately I didn't get that many calls, but they're here in RealAudio. 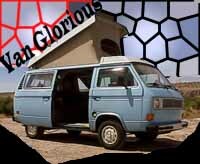 Just a goofy little blurb in celebration of the mighty Van Glorious. Search Cam. Watch actual searches in real time, a hysterical window on the actual uses of the internet. An underground percussion piece directed by Lieutenant Gespacho. See the pictures and hear the sounds in realaudio. WebJam. Another very early Wrybread web project, we set up a system to jam musically over the web. 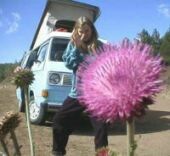 Internet-age folk music, hear the results in realaudio and MP3. Incident at the Circus. An account of seeing someone stabbed at a circus.